A graduate at the centre of an initiative that helps academia transfer its knowledge and expertise to make Britain's industry more competitive will receive a national award on Wednesday 14 March. The national award is the second in a row secured by a Knowledge Transfer Partnership (KTP) project between the University of Teesside and a Darlington-based company in the Department of Trade and Industry (DTI) backed flagship initiative. Mohammed Shahnawazuddin, a 27 year-old mechanical engineering graduate employed by the University of Teesside and Malcolm Engineering Company of Darlington, will be named as one of the five national ‘Business Leaders of Tomorrow’ at a glitzy ceremony in London. Shahnawazuddin, an Indian national, has worked for the manufacturing company for 18 months as a DTI supported Knowledge Transfer Partnership (KTP) associate production engineer. He was nominated for the prestigious prize by his academic supervisor Dr Ahmed Abbas, who heads the university’s Teesside Manufacturing Centre (TMC). Working closely with Dr Abbas and Ruben Pinedo-Cuenca, Enterprise Systems Specialist with the TMC, Shahnawazuddin was able to make a number of significant changes to the company’s production, planning and purchasing processes. Doug Malcolm, the company's managing director, said: “We are now in line for potential savings of thousands of pounds thanks to Shahnawazuddin and the KTP with the University of Teesside. “Having Shahnawazuddin here has given us a fresh pair of eyes to see our way through problems which we were too busy to deal with because of day-to-day firefighting. We really needed someone who was able to stand back and take a long hard look into the future and come up with some fresh ideas. The Knowledge Transfer Partnership (KTP) Awards 07, will be held at the London Marriott Hotel, Grosvenor Square, Mayfair on Wednesday 14th March 2007. Registration is 10am prompt. 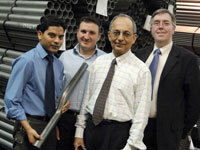 The Teesside Manufacturing Centre offers consultancy, training and research and development support. Email s.a.abbas@tees.ac.uk or phone 01642 342481. Last year Laura Bishop, a marketing graduate from the University of Teesside’s Business School, won one of the six ‘Business Leader of Tomorrow’ awards and went on to become marketing manger with the KTP industrial partner, Country Valley Foods, of Darlington. For further information about the Knowledge Transfer Partnership contract Emma Detchon, KTP officer, University of Teesside, on 01642 384036 or email ktp@tees.ac.uk.